Julia Averkieva (1907-1980) was director of North American studies at the Institute of Ethnography, Soviet Academy of Sciences, Moscow, and editor-in-chief of the journal Sovetskaia Etnografia. 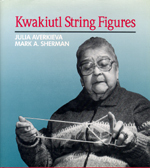 She wrote Kwakiutl String Figures (UBC Press, 1992) [edited by Mark A. Sherman], a book that brings to light the social conditions that prompted Native string figure making. As well, she published Rabstvo u Indietsev Severnoi Ameriki (Moscow, 1941), revised and translated by G.R. Elliot as Slavery Among the Indians of North America (Victoria: Victoria College; Moscow: USSR Academy of Sciences, 1966). Averkieva has assembled the most comprehensive string collection from a single tribe, which is useful to those interested in comparative culture studies since string figures appear in more cultures than any other and over 2,000 individual patterns have been recorded worldwide since 1888. With 102 string figures and 10 string tricks accompanied by step-by-step instructions and traditional chants, Averkieva is able to characterize the social conditions that caused this string figure making amongst the Kwakiutl. Rabstvo u Indietsev Severnoi Ameriki (Moscow, 1941), revised and translated by G.R. Elliot as Slavery Among the Indians of North America (Victoria: Victoria College; Moscow: USSR Academy of Sciences, 1966). [BCBW 2016] "First Nations" "Art" "Anthropology"